As the holidays approach, our grocery budget usually gets stretched quite a bit. And sometimes, we even have a get-together to go to and would like to take something spectacular & delicious but don’t want to spend tons of time & more, importantly, tons of money. This Easy Strawberry Pie is really good, easy to make, and a frugal dessert to share. We made this dessert several times last Spring and Summer, and even my 12 year old was able to put it together on his own. We tried several different ways, using a chocolate graham cracker crust, a regular graham cracker crust and also in mini pies. If you have lots to feed, say a potluck, its goes a long way when you make it in muffin tins. Today, I made it in 3 different sizes to show you the versatility of the recipe. For a single recipe, I got 6 jumbo, 12 regular & 16 mini muffin tins full. Stir boiling water into gelatin mix in large bowl; stir at least 2 minutes until gelatin is dissolved. Add ice cubes to cold water to make 1 cup, stir into gelatin mixture. Stir until thickened, remove any unmelted ice cubes. Add whipped topping with a whisk until well blended. Stir in chopped strawberries. Refrigerate 20 to 30 minutes. While the filling is chilling, make the crust. 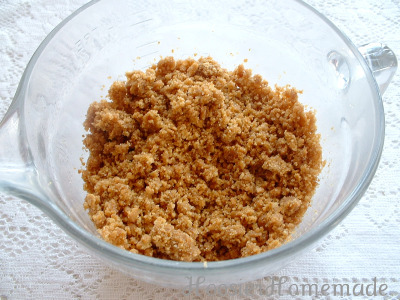 Melt butter in measuring cup, add crushed graham crackers & sugar. Mix well. Spoon into pie plate, or cupcake liners, pat down gently. Bake at 375 degrees for about 10 minutes; you will be able to smell the graham crackers (that’s how I know they are done). Spoon filling into crust; chill for 6 hours or overnight. Decorate as desired. I used a little whipped topping in a decorator bag, some sliced strawberries and strawberries that I had dipped in melted chocolate. For the minis, I added a pinch of pink sugar & a Robin’s Egg. Note: If you are making the pie in cupcake liners, leave them in the tins until the filling is set. That way, they hold their shape. I adapted this recipe from Kraft Food & Family, Spring 2008 issue. 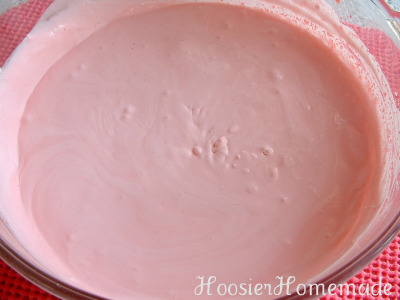 Do you have a yummy frugal dessert that you love to make for the holidays? 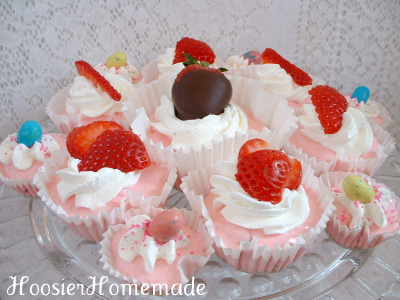 We asked Liz for a frugal recipe guest post after seeing her gorgeous cupcakes at Blissdom! Liz is a SAHM of 3 teenage boys and happily married for 20+ years. 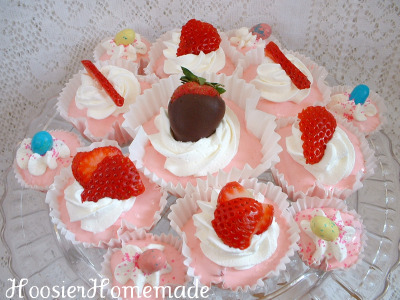 She shares lots of homemaking tips, including her love for baking, cooking and decorating on Hoosier Homemade. She hosts Cupcake Tuesday blog carnival with lots of cupcake creations. Thank you so much for having me! I’m so honored to be here sharing my treats! This looks delicious!! I may have to try it at the next church luncheon. This looks so yummy 🙂 GroceryCoupons.com LOVES great recipes like this that are able to keep to a strict budget. Keep posting great recipes like this! !